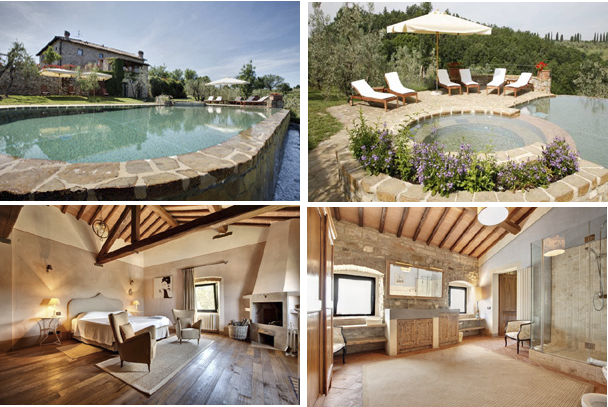 This is an AMAZING OFFER for a DISCOUNTED STAY in a BEAUTIFUL LUXURY VILLA! 3 NIGHTS are FREE if you stay from May 13th to the 25th or from Sept. 28th to Oct. 10th. Donna Amrita Davidge, teaching yoga for nearly 30 years in New York City. Donna also owns and operates Sewall House Yoga Retreat in Maine (chosen top ten worldwide online by Gayot 2009/2010) with her husband Kent Bonham, Swedish chef, musician and massage therapist. Visit their website for more about their teaching www.sewallhouse.com orwww.donnadavidgeyoga.com. 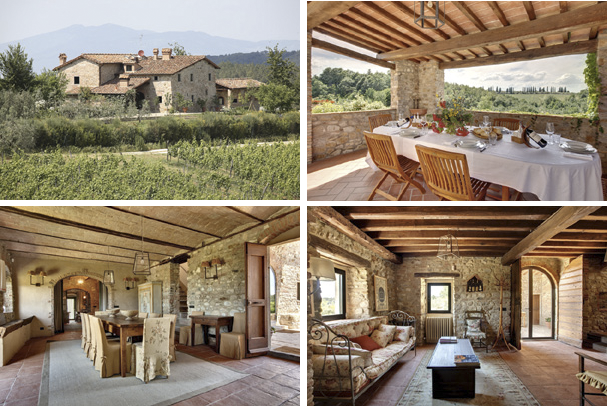 You are invited to their 3rd destination trip to Tuscany, in the heart of Chianti for yoga twice daily, a beautiful setting, delicious vegetarian meals and great outings. We have worked hard to create a wonderful balance between yoga and destination discovery - in one of the world's most sought after locations. Find out more and reserve your place for this unique adventure. Contact Donna directly at info@sewallhouse.com or call 646-316-5151/toll free 888-235-2395 with inquiries or to make a deposit to secure your space. Places are limited, as we are seeking a small group experience. We hope to hear from you! La Terrazza Brunelleschi, located near the train station, has absolutely stunning views of Florence. The cathedral's dome is set right before your eyes, almost close enough to touch. 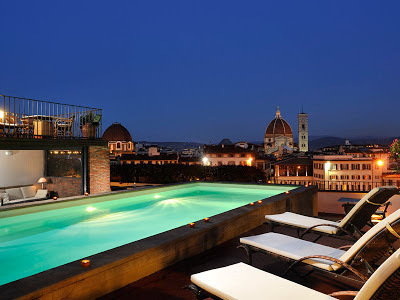 This 4-star hotel has an excellent rooftop restaurant where in the summer it is also possible to have cocktails with a limited food selection. 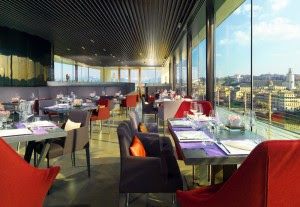 The bar and restaurant Sesto on Arno is located on the 6th floor of this famous 5-star hotel which faces the Arno river. The elegant setting and unforgettable views of nearly the whole city make it a place to seek out either for a romantic meal or an elegant cocktail. Enjoy the panorama from inside the restaurant or for cocktails outside on the covered terrace.There are often special offers for lunch. 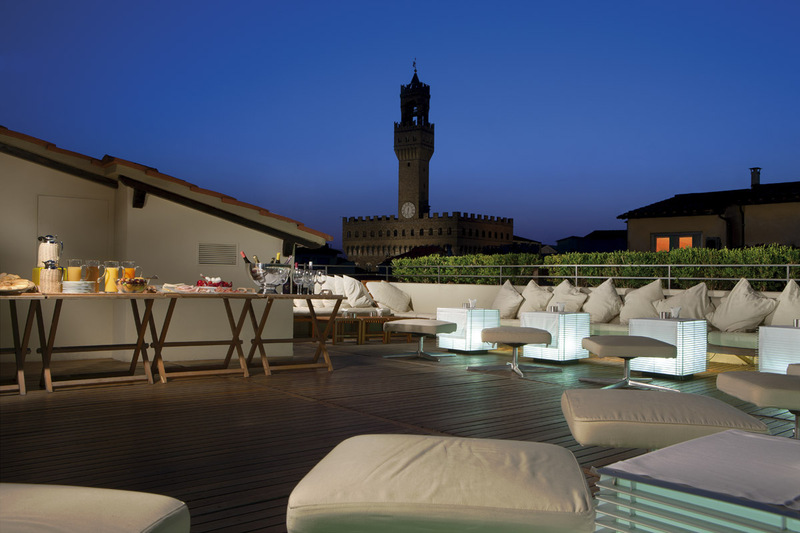 The Sky Lounge Bar offers fantastic views from the top of the medieval Consorti Tower which overlooks the Lungarno. Chic and classy, as the famous designer envisioned it, where contemporary meets historic, this is a fabulous setting to enjoy a panoramic aperitivo in Florence. Located in Piazza Santa Maria Novella, the rooftop terrace of this 4-star hotel offers a lovely apertivo buffet during the summer months. The incredible views are nearly 360° and there is a pool to add to the summer atmosphere. 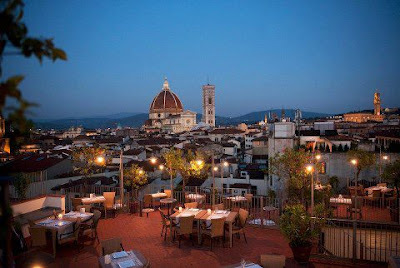 Located on a hill overlooking Florence (near the Forte Belvedere) this fish restaurant and its terrace bar are part of the Villa Bardini and its gardens. 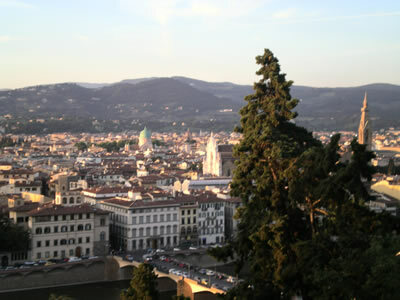 There are stunning views of the city skyline and the unique venue has a modern art gallery, visual arts installations and music to enrich the experience. 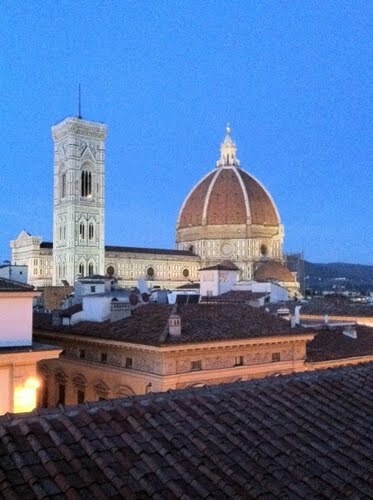 The famous department store located in the heart of Florence has a great rooftop restaurant and bar, La Terrazza, which makes a perfect spot for nice lunch or an afternoon cocktail. The views are 360°, so the hardest part might be deciding which way to face! 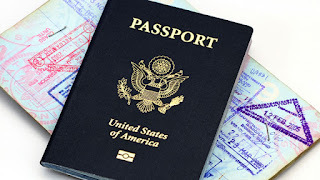 It’s certainly a great way to take a shopping or sightseeing break.